Saturday 8th October 2016 - Cool with occasional showers, and then a lovely sunny evening. 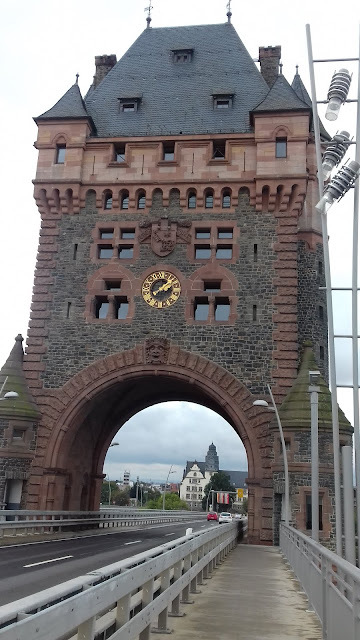 This morning we left Bad Durkheim and headed over to Worms - a town that is found on the banks of the River Rhine, and a journey of only about 30kms. We landed in a small Stellplatze that didn't have anything to offer in the way of scenery but it's very convenient for the city and also right on the river, so brilliant for tomorrow's planned cycle trip. Also, we can't complain, because the pay machine was broken so the 5 euro parking fee was waived and we're here for free! 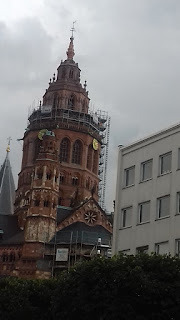 So, for today our plan was to go into, what is described as one of the oldest towns in Germany, to see some of the sights that interested us the most. And we really couldn't start at any other place than The Nibelungen Bridge who's arches tower over a 6 lane main road and allow huge volumes of traffic to cross the Rhine. The current bridge is the third on the site and was built between 2001 and 2004 (although it looks much older), and it was erected to take the place of it's predecessor from 1950 because that was inadequate to cope with the traffic demands. The first bridge on the site was built in 1938 but that was destroyed in World War II. 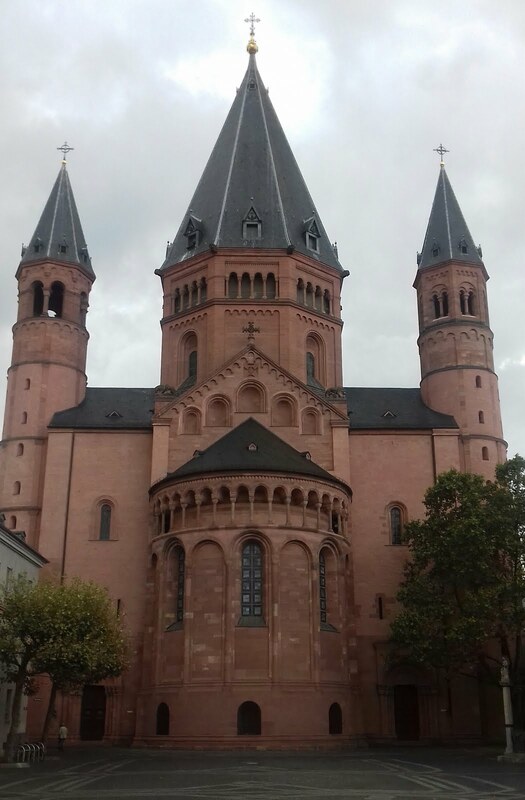 Our next target was the Dom St Peter - there seemed to be loads of churches to choose from to visit, but this one dominated the sky line, and our guide book told us it was one of the oldest and largest Romanesque cathedrals in Germany. 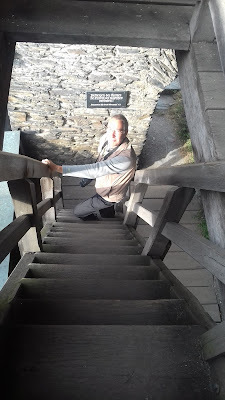 We learnt that only the ground plan and the lower part of the western towers belong to the original building and that that was consecrated back in 1110, with the remainder mostly being finished in 1181. Unfortunately, there was lot of restoration work and scaffolding on the outside of the building, but as long as you caught it from the right angle, that didn't take anything away form the grandeur that the 4 towers and 2 domes provided. And this continued once we were inside with a magnificent organ, 2 very ornate alters and several intricately carved biblical scenes, as well as numerous very colourful stained glass windows. 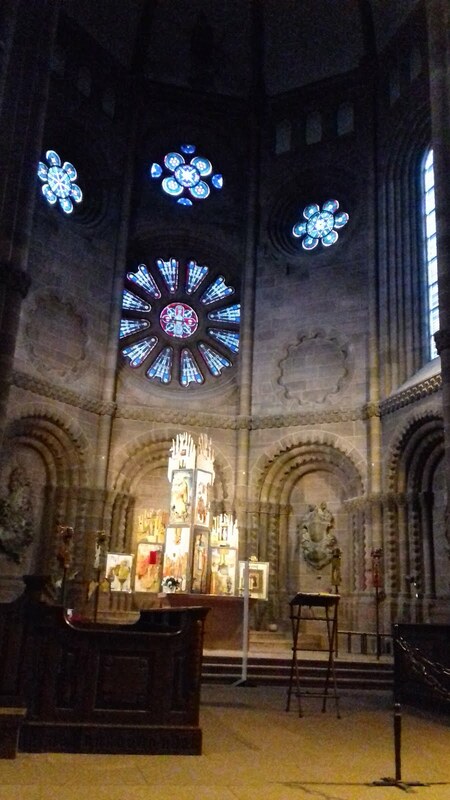 Along with this, just the general hugeness of the place was something special to behold, it is 100 metres long and 27 wide, and the roof of the nave towers in arches 26 metres above, but then above that comes the two domes whose pinnacles reach 40 metres. 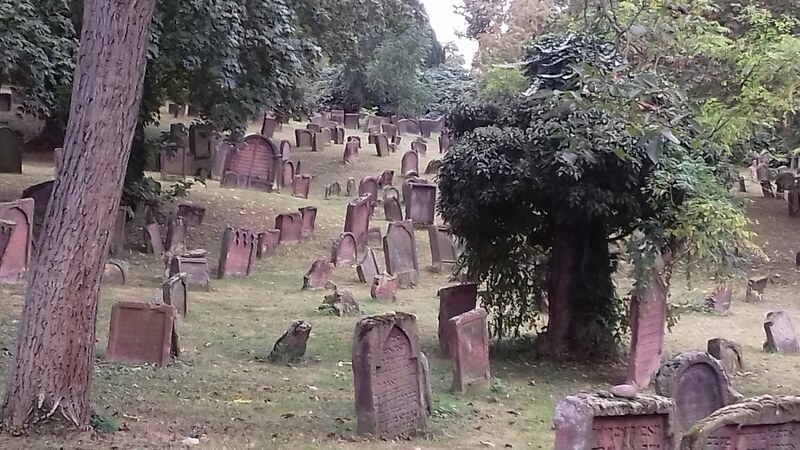 Next we visited the Jewish Cemetery, but because of their Sabbath (which begins at nightfall on Friday and lasts until nightfall on Saturday) we couldn't go in, although we had a good view of the ancient stones from the gateway. It's the oldest Jewish cemetery in Europe and the oldest headstone dates back to 1059, but even if we had been able to get nearer we wouldn't have been able to read any of the inscriptions because they were all in Hebrew. However, it looked a very peaceful place to rest. 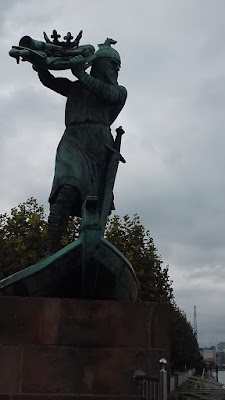 Now, it is said that the city of Worms is inextricably linked to the Nibelungs - I'd never heard of them but John knew all about them, particularly in relation to Richard Wagner's 4 operas of The Ring Cycle - the most famous piece of music being The Ride of the Valkyries. So to find out more we toddled off to the Nibelungs Museum that occupies two picturesque towers in the medieval city wall. 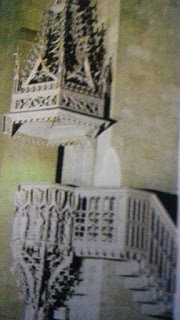 Here we were informed that the 'saga' had originally been written in verse by an unknown poet around the year of 1200! Unfortunately, the museum only provided the story via hand held audio devices, but this wasn't much good because John is quite deaf and usually can't hear what is being said on them. 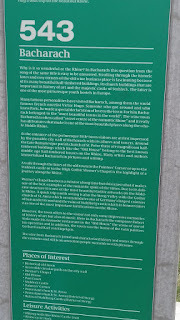 However, when I explained this to the admission lady she let us in for free, so we were able to explore both the museum and the city wall, and then come home to find out more from the all knowing oracle of the internet. 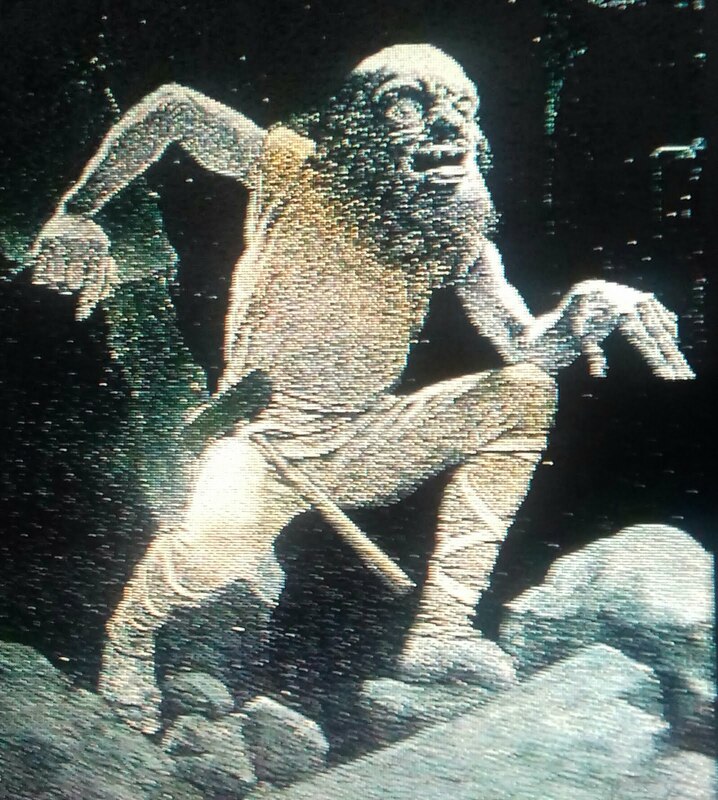 It seems that the epic poem of the Middle Ages is based on old Norse legends and tells the story of Siegfried, a German Prince and also of evil dwarfs - The Nibelungs. The myths tell of legendary rulers, Princes, Princesses and heroes and how Siegfried is eventually slayed by Hagen von Tronje, and how the treasure of the Nibelungs gets thrown into the Rhine. After reading one or two of the complex tales I really got a bit confused as who was who and who was doing what to who - and as for the opera - I don't think I could manage several hours of that! Maybe I'll remain a philistine and just stick to the much more enjoyable exploits on Eastenders! 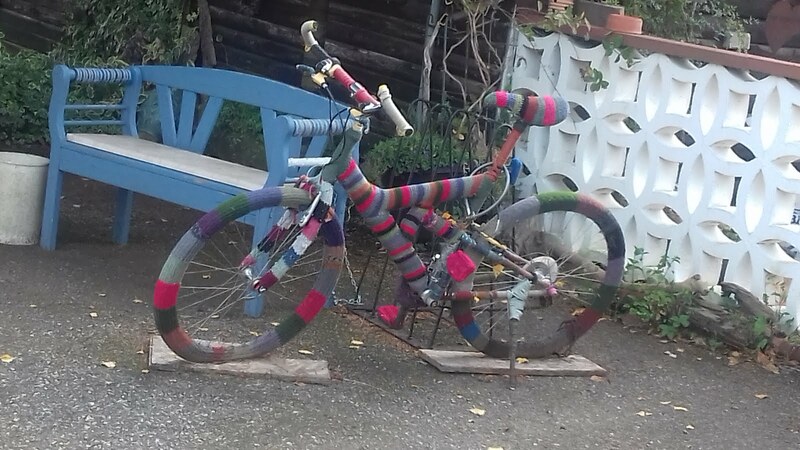 Even the tyres are knitted! 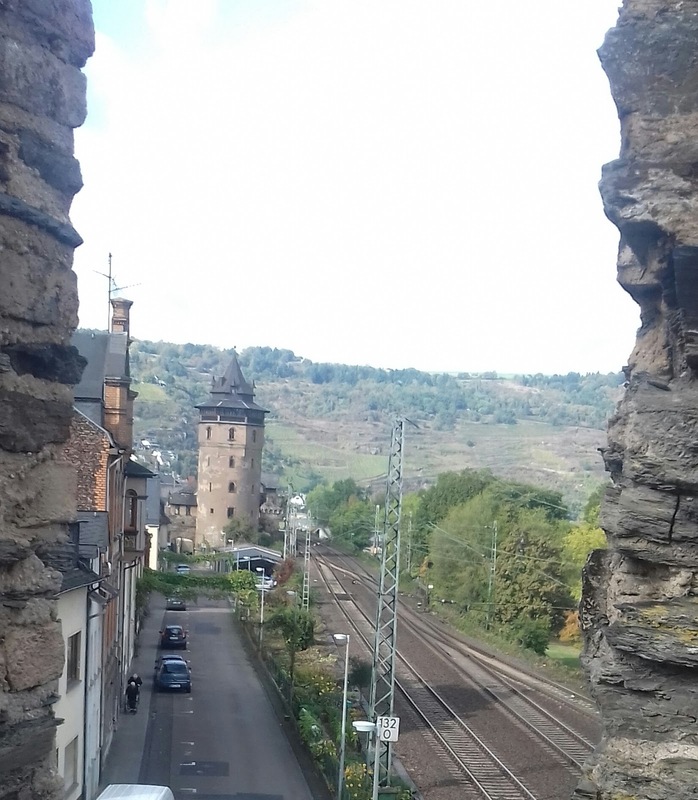 This morning we had decided to go for ride and John had chosen North along the Rhine to try and avoid some of the massive industrialisation that there is in this area. However, to start with there was no help for it, and we found ourselves riding past several huge smoking 'plants' and factories, but happily, that only lasted for about the first 3 miles of our route. Then the scenery became much more rural, and we were also very surprised to find a knitted bike along the way! And after that came frequent stretches where we were right on the banks of the river that was quite busy with both cruises and freight barges, but even here, it didn't really have the WOW factor I had been expecting. Having said that, there's plenty more of it to see yet so I'm sure further along it will impress. 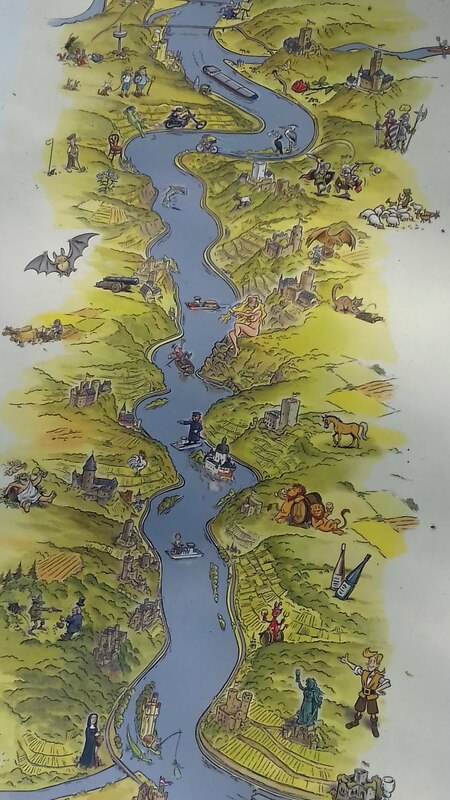 The Rhine is 1320 kilometres long with it's source in Switzerland, and from there it flows through 6 countries which include Liechtenstein, Austria, Germany, France and the Netherlands, before flowing out into the North Sea at Rotterdam. Today's ride was nearly 60 kms so that still leaves over 1200 kilometres for another time! Monday 10th October 2016 - Another overcast day but no rain and the sun did peep out around dinner time. This morning we left Worms and travelled the short distance to Mainz, but once again we found ourselves passing huge tracts of land covered with belching smoking chimneys and mile after mile of industrial units - one of them being Procter and Gamble - apparently this Western corner of Germany is the wealthiest but also the most heavily industrialised region in the country. So, as we travelled I did wonder if Mainz would be to our liking, and probably because it is a city area, it wasn't, but for the short time we were there we found some very interesting features, and the Stellplatz we're staying on is well insulated from the urbanisation with pretty leafy trees all around. 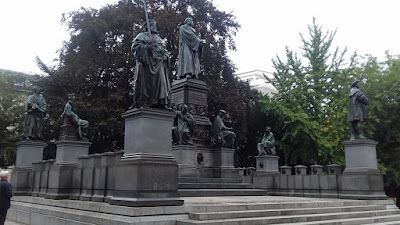 Because we only wanted to spend the afternoon in the city we'd done a bit of homework with our guidebook and highlighted the main things we wanted to see - namely The Mainzer Dom (St Martin's), the statue of Johannes Gutenberg and The Narrenturm or Carnival Fountain! Our first target was very easy to find because it dominates the skyline - The Red Mainzer Dom or St Martin's Cathedral. 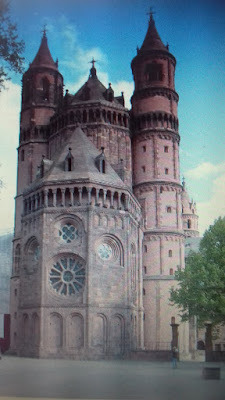 It is built in red sandstone and construction was mainly between 1081 and 1137, but some of the outside, was once again covered in scaffold to facilitate restoration. Once inside, nothing could take away from the magnificence of the arches and domes that towered above us, but it was dark! I'm not sure if someone had forgotten to put a 'bob' in the metre, but you almost needed a candle to light your way, and taking photo's was impossible because of the gloom. 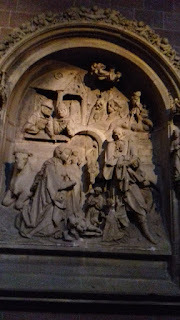 However, we did take the time to explore and marvel at the exquisite workmanship of the missionary, along with the many sculptures, paintings and sections of the building such as the outside cloister. 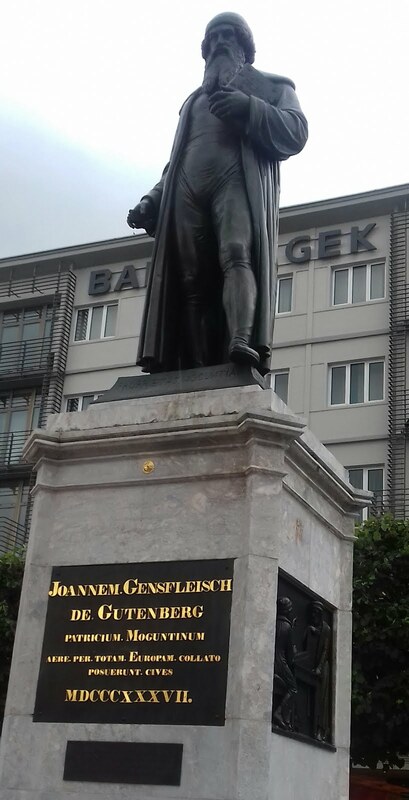 Next we looked for Johannes Gutenberg - the inventor of the printing process using movable metal type. 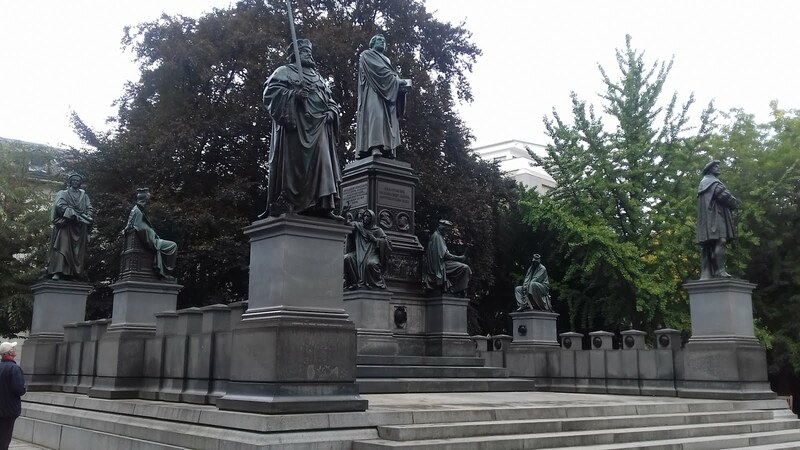 Apparently, the letters were cast in a special apparatus and set in columns, and Gutenberg himself prepared a Bible for printing and publication in 1454, but of the 200 printed only 46 have survived to this day - and our information informed us that they are just about priceless! 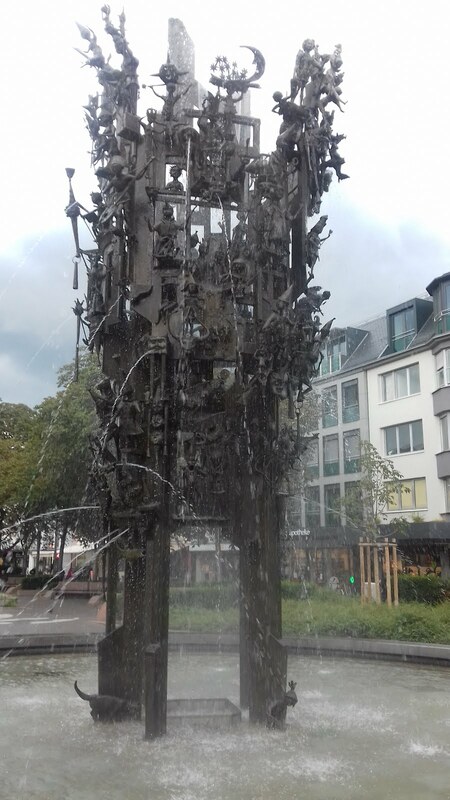 Finally, we went to see the nine meter high Narrenturm which was finished in 1967 and is adorned with more than 200 bronze 'foolish' figures. 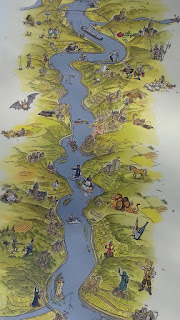 All the figures in the three tiers have a connection with fools and the Mainz Carnival in particular, and amongst them you are supposed to be able to spot Father Rhine and Daughter Mosel! If we'd known that at the time we might have tried harder, but we're not going back for another look! 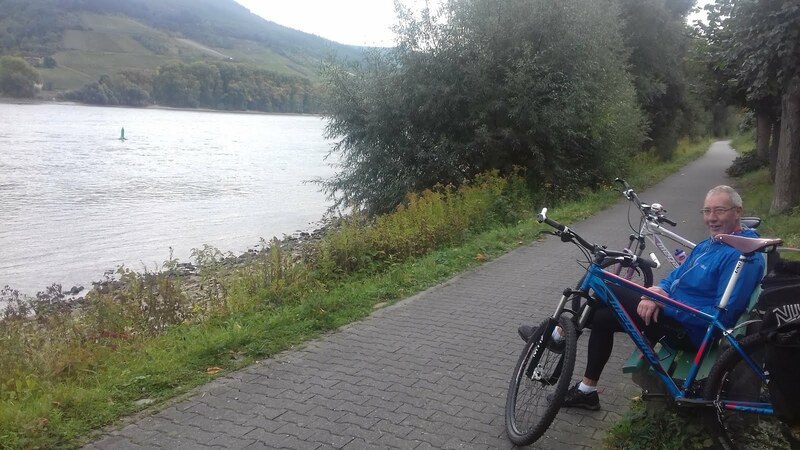 While we were out we also walked by the river and browsed around the many shops - particularly the E-bike shop, but we didn't see anything that convinced us to spend our (bike) money in Germany - that will be a pleasure we have to look forward to when we get back to England. 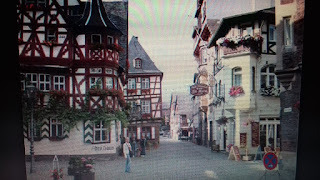 Then it was back home for a warm and a cuppa, and a bit more planning about where we'll move onto tomorrow - we think probably the town of Oberwesel - a place that is found about half way along the Rhine Valley, and which is said to be much more picturesque than what we have seen so far. Tuesday 11th October 2016 - Another cloudy day but with the sunshine popped out several times in the morning. 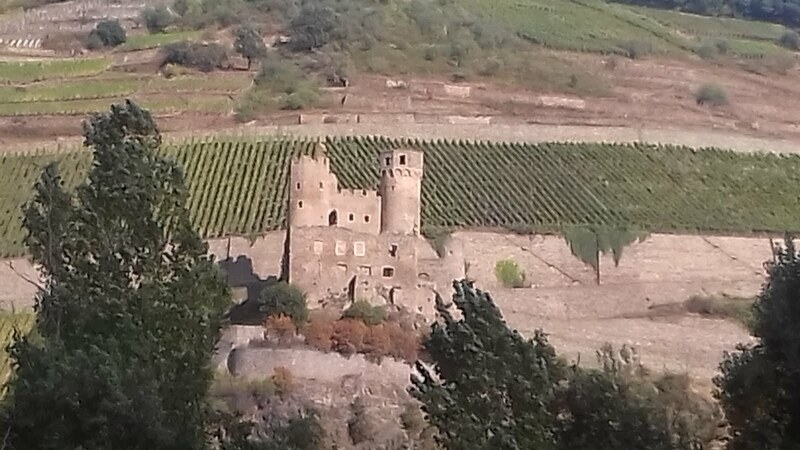 Today, as planned, we moved about 30 miles up the road to a Stellplatz at Oberwesel, and at last the Rhine has fulfilled it's promise of providing stunning scenery, because as we drove into the valley we were rewarded with views of pretty castles and vine clad hills (some so steep we wondered how they managed to pick them). Our parking proved to be bustling and busy but we are near enough to the river to almost get our tyres wet, and the cycle paths start from our doorstep! 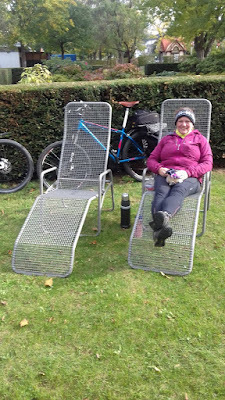 Initially, our plan was to just stay here for two nights and cycle in one direction today and the other tomorrow, but we like it so much we've decided to stay at least 3 days, therefore the bikes have stayed in the cupboard. So instead today we've walked around one of the main attractions of Oberwesel - the 3 kms of town walls along with it's 16 towers, some of which we were able to climb by going up steep ladders or spiral staircases. 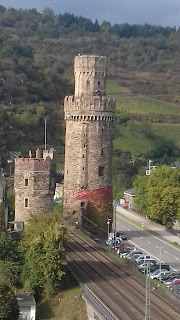 Many of them have tongue twister names such as Niederburger Torturm, Ochsenturm and Haagsturm, but from us they just produced 'oohs and Rs' as they came into view! 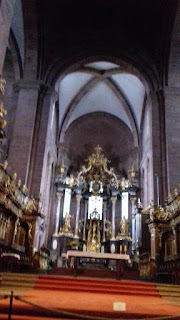 And of course like every town in Germany, there were churches to visit. 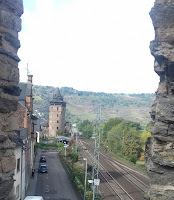 The first one - St Martinskirche is set on the hills overlooking Oberwesel, and what makes it special is the bell tower into which the church is integrated - it is one of the towers that formed part of the city walls and fortifications. 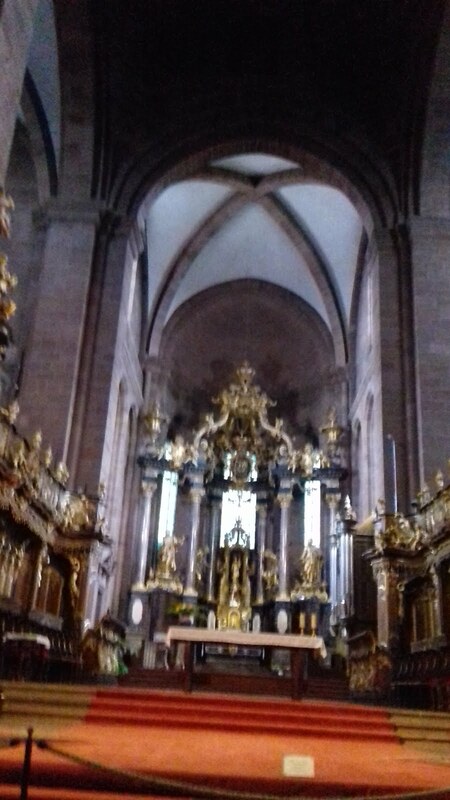 The second big church in the town is the Liebfrauenkrche which is said to have a golden alter, but we were unable to go in today because there was a funeral in progress - maybe we'll go back another day. Also, by this time, there was an odd spit spot of rain, so rather than risk a soaking, we nipped back to T4rdis2 and I put my spare time to good use by doing some much needed washing. And the rain - that just petered out and passed by! Well, as planned we went for a ride today, but when we got up the weather looked so grim we decided not to go too far - and did I mention it was bloody cold. So with that in mind, we wrapped up warm and headed upriver towards the town of Boppard - a route we later realised had taken us past The Loreley Rock. 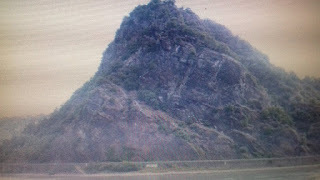 Apparently, this is a place where a great many boats have been smashed onto the rocks by strong currents, but if legend is to be believed, it blames the many accidents on a beautiful blonde Siren who sits on the rocks combing her hair and singing such a lovely song that sailors are lured to their deaths! 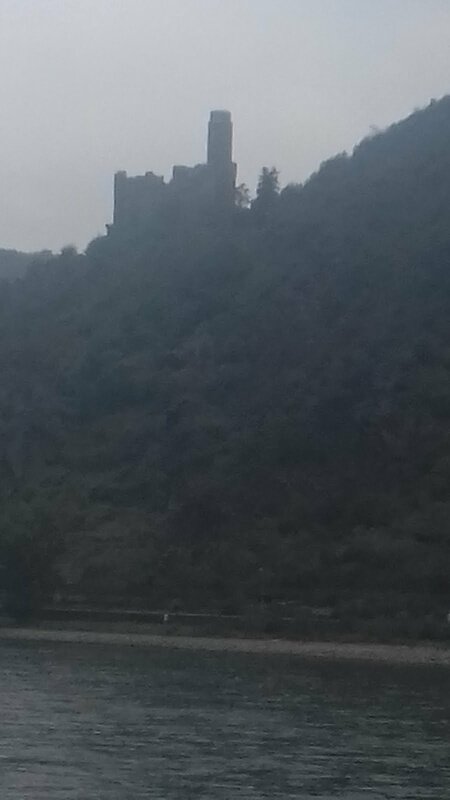 As we sailed cycled along we passed quite a few castles that peered eerily down on us from the high hillsides on both slopes of the valley, but the light was still very poor, so really they formed nothing more than ghostly silhouettes. 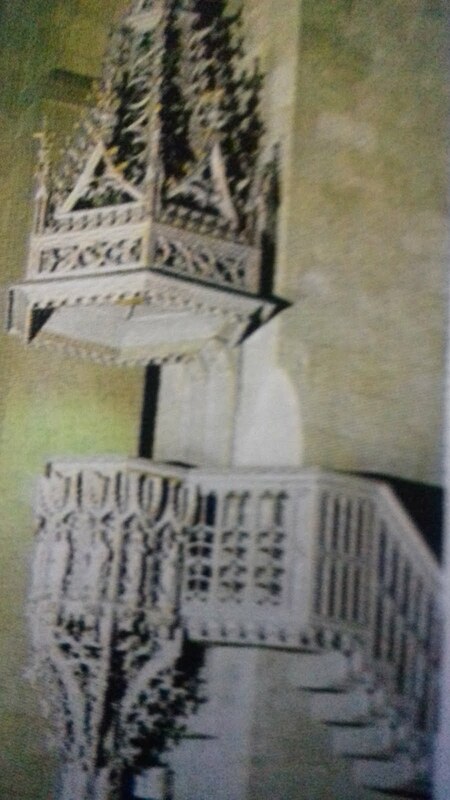 It was easy to imagine that they had probably had a very bloody past and could tell tales that would have made our toes curl! 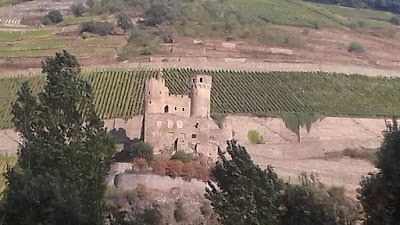 But along with the castles were field after field of vines - so one of our main topics of conversation was about how they were picked and how many bottles they would be able to produce form each one! Who knows and does it matter? What we do know is we'll be sampling some (more) while we're in this area! Then, at about kilometre 21 we arrived in Boppard and found a beautiful historic town full of quaint half timbered buildings and more cobbled streets, and it was easy to see why it had been included in the 67 kilometre stretch (that starts at Bingen) that is listed as a UNESCO world heritage site of the Upper Middle Rhine Valley. However, by now a fairly constant drizzle had set in so although we paused to eat our lunch in the town, we made out stay fairly short and then set off home, and by the time we got there we were fairly wet and cold, so it was heating on and we snuggled in for a late afternoon and evening of reading and telly - along with said bottle of wine! Thursday 13th October 2016 - Better than yesterday with some glimmers of sunshine but quite windy and cold. This morning we looked out of T4rdis2's windows and debated if we should venture out on our bikes again or not. We did - but we hadn't gone far when we debated the sensibility of our decision, especially as we were pushing into a fairly strong and cold headwind. However, it had taken us so long to get dressed with the multiple layers we'd donned, we thought to give up at that early stage would be sensible out of the question! 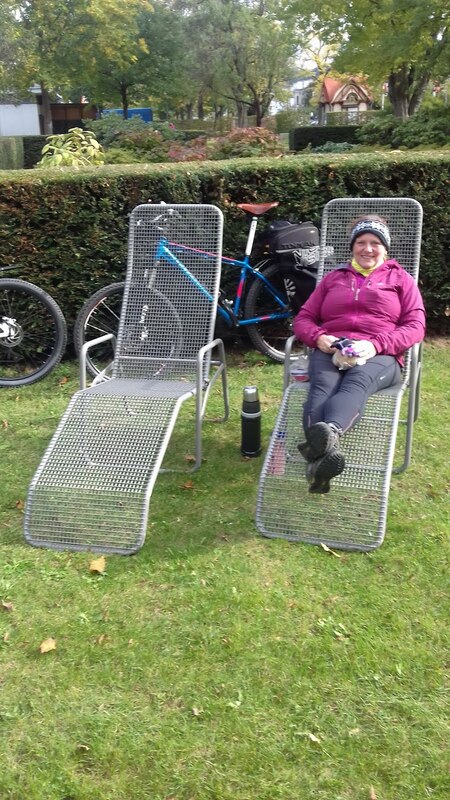 And in the end we were very glad we'd persevered because we really did have a very enjoyable ride - especially as we managed to hide from the wind while we had both our coffee and lunch breaks. We'd set off in the opposite direction to yesterday, and the ride was so much better because, while yesterdays track had mostly been at the side of the main road, today's was well away form it and nearly all right at the side of the river. Again, there were numerous castles gazing down on us (apparently more than 40 along the entire route), but this time, with occasional blasts of sunshine reflecting on their ancient walls, they looked more like fairy tale settings than anything more sinister. 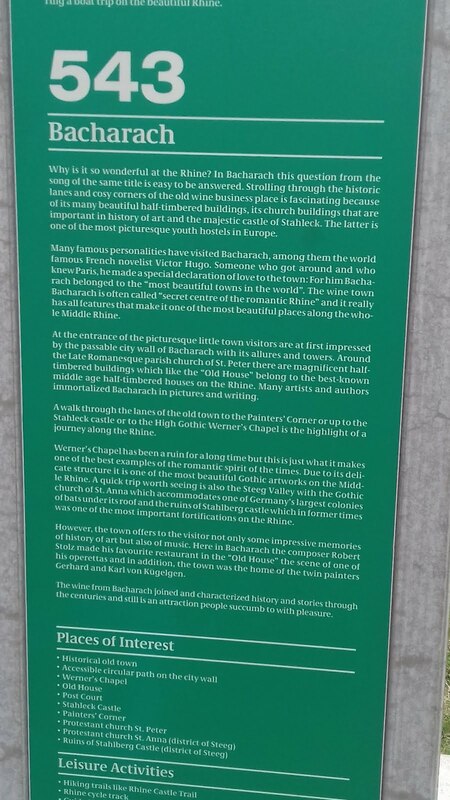 Today we also noticed the UNESCO information panels that are set at regular intervals along the trail - they seemed to pop up in every village we passed through and provided details (in 4 languages) of what you could expect to find there. These included Bacharach, Oberdiebach, Rheindiebach and Trechtingshausen to name but a few, but if I tell you all about what they said you'd be reading this for the rest of the night! So to cut a long story short, take my word for it, this part of the world is well worth a visit, there really is something for everyone here and I'm sure we'll be visiting again sometime in the future. 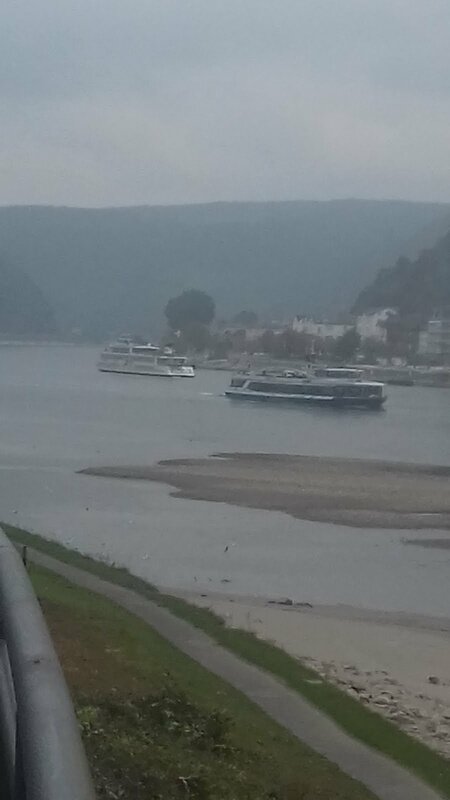 Our target for today was the town of Bingen right at the start of the UNESCO trail, and it was also here that we found the confluence of the Rhine and Nahe Rivers along with a stunning promenade that was built in 2008 for the State Garden Show. Today it is still backed by very pretty gardens which include one especially for Roses, a place that also provided very comfy chairs, so how could we resist stopping here for lunch. 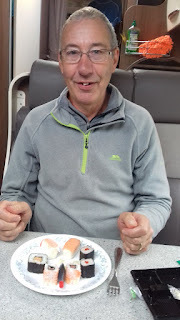 While we ate our lunch we also got chatting about the huge barges that traverse this waterway, and the very frequent trains that chug along both sides of it. 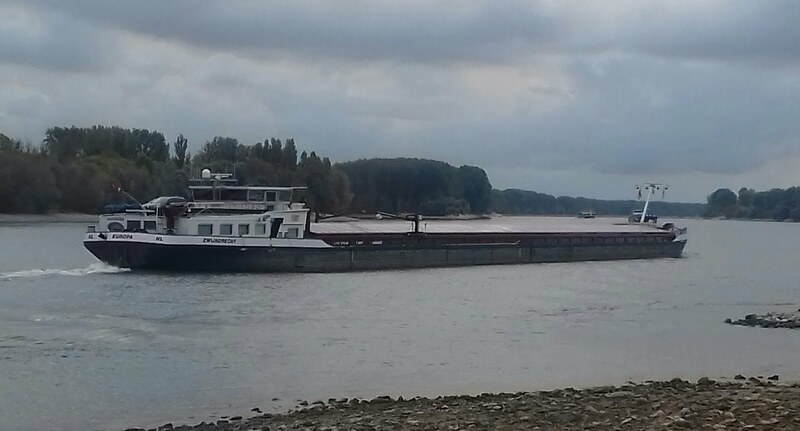 Some of the big barges can carry up to 100 containers or huge loads of coal or other minerals, and with regard to the trains, John calculated that, in freight, they were carrying the equivalent of at least 30 or 40 lorries! That's what you call cutting a carbon footprint! John enjoying his Sushi starter! By now the afternoon was drawing on so it was time for our return journey which presented different views and vistas as we went. We also had the major benefit of the wind on our backs, so the 20 odd kilometres that we needed to travel just flew by. 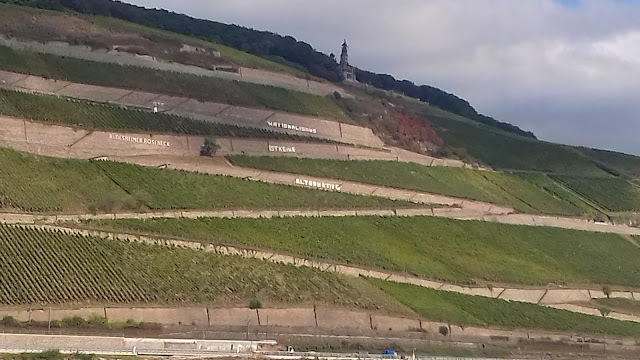 Tomorrow we will move onto Koblenz where the Rhine meets the Mosel, and I'm sure we'll have a tale or two to tell from there, but for now I'm going to say 'cheerio' so that I can put my feet up and enjoy another drop of the lovely produce of the vines in this area.